Mushroom Mix-Up is a 4-player minigame found in Mario Party. 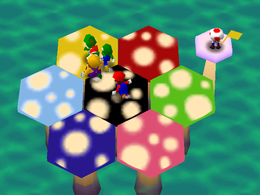 Players have to stay on the same colored mushrooms as Toad's flag. The other colored mushrooms will then slowly sink. Falling into the water results in a Blooper appearing and carrying the player away. The longer the players stay in the minigame, the faster the colored mushrooms sink down as Toad keeps changing his flag. The last player standing wins the minigame. The minigame can be purchased from the Mini-Game House for 50 Coins. The minigame Hexagon Heat from Mario Party 2 follows the same rules. Game Rules – "Move quickly to the same colored Mushroom as Toad's flag. If you're too slow, the mushrooms will sink." Advice – "Do a Hip Drop on others and squish them down. If you squish them, they can't move for a moment.'" If the game lasts too long, the movement of mushrooms gets so fast that players can survive by just jumping at the right timing, or even without jumping at all. This page was last edited on September 18, 2018, at 16:42.